Have you heard the name Gary Vaynerchuk? If not, learn from one of the best of the best when it comes to MASSIVE implementation of smart social media marketing. One might say that Gary is the epitome of the American dream, having been born in the former USSR (in Babruysk). What’s interesting, however, is that many people don’t realize or remember that Gary is a wine guy, not a strict internet marketing guru. You’d never know it – and that might be one of his best qualities. At only 34 years of age, Gary shows that following your passion is just as important as the techniques you use to become an internet marketing guru. You have to love what you do in order to work as hard as possible to make it a success. Gary manages business, family, friends and all the online stuff – and personally responds to all emails. Gary started Wine Library TV in 2006 as a way to promote wines that he loved and to appreciate wine with the help of an audience. Originally designed to review wines and to answer questions posed on his Facebook page, Gary’s audience began to grow. He now has around 90,000+ viewers of his daily wine tastings. Most of the time, he’s the only one in the chair, tasting the wines, but over time, he’s had some other folks help him out in his duties, including Timothy Ferriss. At first glance, Gary’s story seems more like luck than anything else. After all, all he does is tape himself when he’s drinking wine. But his passion allows him to be an authentic person with whom others can truly relate. He’s the big brother to the masses and an internet marketing guru as a result. While Wine Library TV is the biggest venture of Gary’s at this point, it’s launched other avenues for his life and business. As of March 2009, Gary signed a ten book contract deal with HarperStudio to produce books related to internet marketing and promotions. His first book, Crush It! 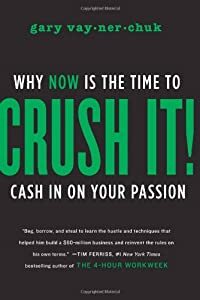 (Why Now is the Time to Cash in on Your Passion) started out at #2 on the New York Times Bestseller list. And what’s even more intriguing about the book deal is that it had a low advance up front, but offers high royalties. This is a unique deal, and it might become the way that book publishers do business in the future. To promote his book and his Wine Library TV show, Gary is relentless in using his Facebook page, his Twitter account, and his website – garyvaynerchuk.com. He’s always posting something on these sites, helping to stay connected to his fans by answering questions. He has been named a Market Watch Leader in 2003, the youngest ever, while also being someone who sits down and simply talks directly to his audience, informally (and with a VERY direct voice). Social Media / Internet Marketing Tips To Steal From Gary V.
What does Gary know about being an internet marketing guru that you might want to copy or learn from? Be authentic: When you see Gary talking about wine on his TV show, you will see that he truly cares about wine and about doing justice to it with the reviews he gives. He knows you can’t taste it, so he tries to give you the experience you would have if you were in the room with him. Promote what you love: Gary loves wine, plain and simple. This allows him to continue to enjoy what he does, even as he works long hours and interacts with all of his fans as much as possible. Energy is fueled by passion. Have faith in your community: Gary knows that people want to hear from him and he has faith that they will show him the same respect that he shows them. One video diary offered the idea that Gary was going to take some time away in order to get his edge back. The positive feedback he received was confirmation of his fan’s adoration, but also confirmation that honesty works. Go where your fans are: By offering video shows online, Gary is able to be where the new modern fans are – online. This also allows Gary creative freedom to do the things he wants to do. Interact often and in different formats: From the comments Gary requests to the live chats during his videos, he is never far from the conversation his fans are having. He responds to tweets, emails, and many comments as much as he can. Be honest: At no time does Gary seem to be trying to be someone he’s now. When he has a question about a product, he asks his fans what they think. He admitted how hypocritical it is for him to assign points to his wine ratings when he’s said he doesn’t like the point system. He’s a genuine guy. Passion, knowledge, and effort are what lead to success: Gary shows that his passion is the cause for his success more than any internet marketing ploy. Have you picked up a copy of Crush It? I recommend it.